Area businesses and organizations are encouraged to register now for booth space at the 2013 Springfield Collegiate Career Fair at the University of Illinois Springfield. The fair will be held on Thursday, February 12, 2013 from 11 a.m. to 3 p.m. at The Recreation and Athletic Center (TRAC) on the UIS campus. 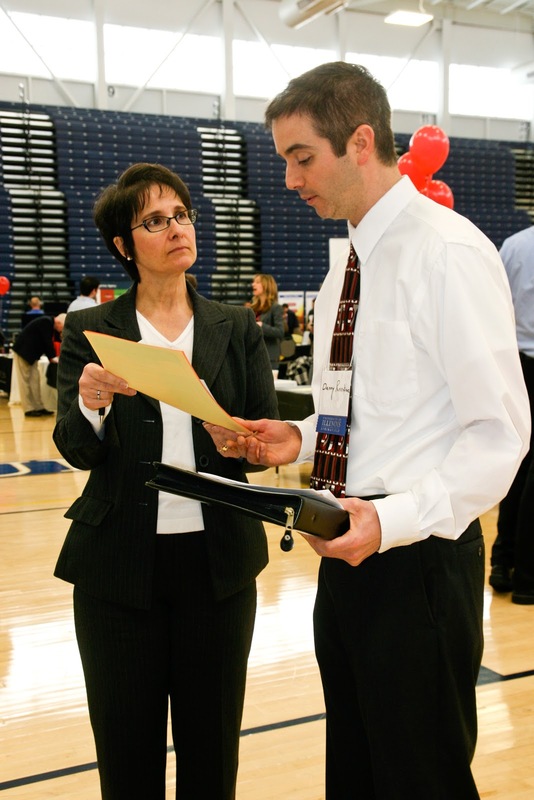 The fair is an annual event hosted by the career development offices at the University of Illinois Springfield, Benedictine University at Springfield, Robert Morris University, and Lincoln Land Community College. The Springfield Collegiate Career Fair is intended to bring students from all four institutions, local employers, and organizations together to discuss career opportunities in a broad range of available positions. Local businesses who are recruiting students to fill part-time jobs, internships, volunteer and other career opportunities are invited to participate in the event. The event has an average attendance of more than 400 students and alumni. Booth assignments will be made on a first-come, first-served response basis. There is no cost for employers; however groups must register for space by February 4, 2013 at 5 p.m. Employers can register for the Springfield Collegiate Career Fair career fair by visiting the UIS Career Development Center’s online system called “CareerConnect” at www.uis.edu/career/. Click on the “Employers: Login here” option to get started. The “CareerConnect” system also allows employers to establish a company profile and post career opportunities at no cost. UIS students and alumni are then able to view and apply for positions directly through the system by uploading their resume. 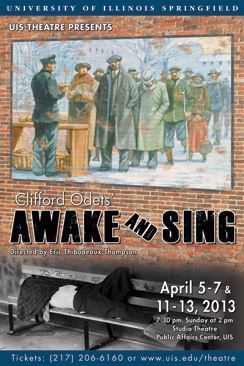 The Theatre Program at the University of Illinois Springfield will hold open auditions and crew interviews for the second production of its 2012-2013 season - Awake and Sing! a play by Clifford Odets - on Tues., Jan. 22 and Wed., Jan. 23, 2013. Crew interviews start at 6 p.m. and acting auditions start at 7 p.m. both nights in the Studio Theatre, on level one of the Public Affairs Center at UIS. Call-backs will be at 7 p.m. on Thurs., Jan. 24. Auditions are open to students, staff, faculty, and community members with or without experience. Auditions will consist of “cold readings” from the script; prepared monologues are welcome, but not mandatory. Headshots/resumes are appreciated, but are not required. Scripts are available to anyone for 3-day check-out at the Brookens Library circulation/reserves desk. Those interested in working on a crew (running crew, costumes, props, stage management) will be asked to fill out a crew application form and meet briefly with the production staff. Production dates are April 5-7 and April 11-13, 2013. The curtain time for Thursday, Friday and Saturday night shows is 7:30 p.m. with the Sunday performance starting at 2 p.m. Ticket prices are $14 for adults, $12 for senior citizens (65 or older with a picture I.D. ), $10 for UIS Faculty/Staff and $8 for UIS students (and all other college-level students) with a valid, current i-card or college I.D. card. Please note that a service charge, not included in the prices above, from Sangamon Auditorium will be added to each ticket price, at the time of purchase. To avoid a higher service charge, buying tickets in person at the Sangamon Auditorium ticket office is highly recommended. For more information about auditions, the play, or helping behind the scenes, contact Eric Thibodeaux-Thompson at 217/206-6613 or ethib1@uis.edu. You may also visit the Theatre Program’s website at www.uis.edu/theatre.